We are through with shearing for 2014! After 3 weekends dedicated to shearing our herd of 50 alpacas ages 7 months and up, David and Claire were ready to celebrate. 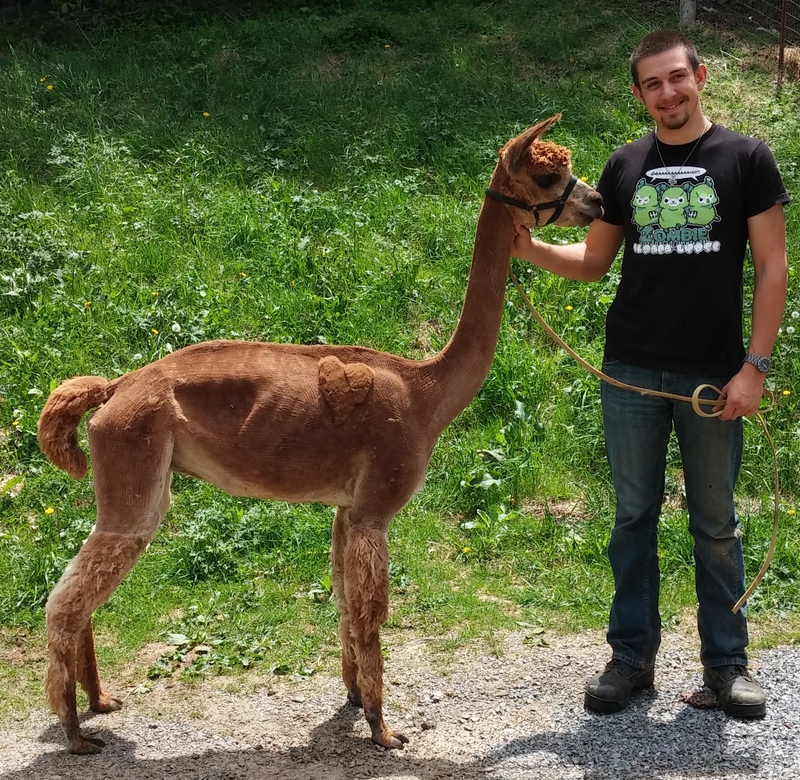 Our last two alpacas to shear were our two oldest girls, 13 year old farm matriarch Lystra and 17 year old Angelyn, who moved to our farm to retire a couple years ago. 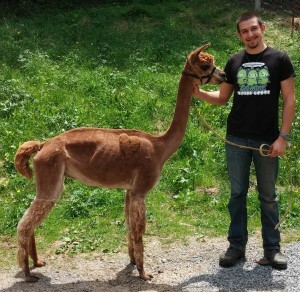 David was inspired to leave a small heart of fiber on Lystra, to show her farm spirit. David and Claire had bigger plans for Angelyn (preapproved by farm and fiber manager Sharla). 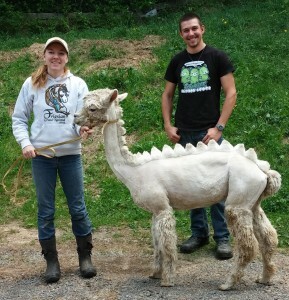 Inspired by a photo from fellow alpaca shearer and owner of Fireweed Alpacas Teri Phipps, David proposed they create a stegosaurus cut for our oldest farm member. Angelyn seemed to be in agreement as she patiently waited to get her hair cut and then proudly showed off her fashionable new hairdo. All the other alpacas were quite impressed. Of course, all the other alpacas received much more traditional cuts, and are looking sleek and ready for summer. 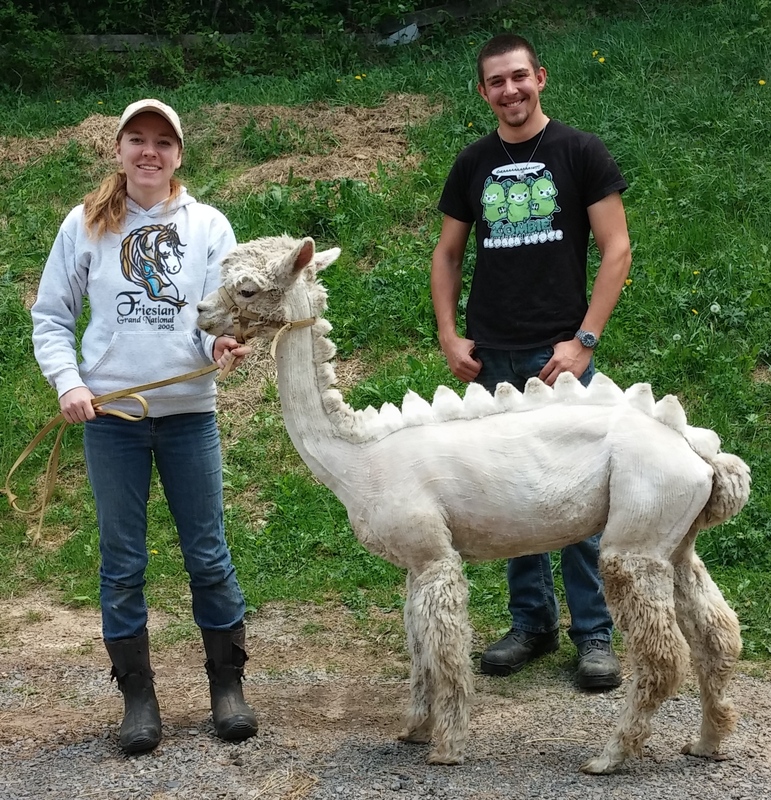 David and Claire are still working on shearing for the almost 30 small alpaca farms in the area that they shear for each year, but will finish up by the end of the month. Sharla is ready to start her big job of the year, and tackle the 283 pounds of fiber provided by our lovely alpacas this year. 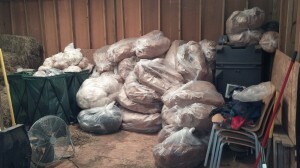 All the fiber must now be sorted to prepare for shows and processing. If you are interested in purchasing a whole fleece to work with, contact us now as this is the best time to choose your fleece. We have a great selection of colors and fiber grades from which to select.